The Oldest Catholic Church in London, patron of sore throats. Description: Every February a ceremony takes place here in Londons oldest Catholic church, St Ethelredas, on St Blaises Day (St Blaise saved a child from choking to death on a fish bone and so is patron saint of throat sufferers). Two candles are tied together, lit, and touched on to the necks of people suffering from sore throats. St Etheldreda's Church is just a stone's throw from the noise and bustle of modern day London and it is hemmed in by the glittering wealth of Hatton Garden, where gold, silver and diamonds are traded and millions of pounds change hands daily. But amid the clamour of mammon, there stands this hidden ancient gem, a spiritual sanctuary of the Middle Ages, a haven of peace and tranquillity. 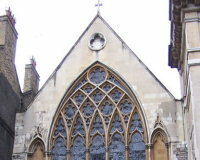 St Etheldreda's Church was the town chapel of the Bishops of Ely from about 1250 to 1570. It is the oldest Catholic church in England and one of only two remaining buildings in London from the reign of Edward I. It was once one of the most influential places in London with a palace of vast grounds. Etheldreda was quite a revolutionary. She set free all the bondsmen on her lands and for seven years led a life of exemplary austerity. Princess Etheldreda, daughter of King Anna, a prominent member of the ruling family of the Kingdom of East Anglia, was born in 630. She wanted to be a nun but agreed to a political marriage with a neighbouring King, Egfrith, on condition that she could remain a virgin. When the King tried to break the agreement, she fled back to Ely, where, as well as founding a religious community, she also built a magnificent church on the ruins of one founded by the efforts of St Augustine himself but laid waste by war. 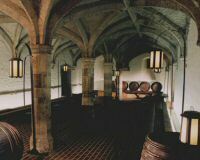 The crypt here is where Henry VIII attended a lavish five day feast in 1531 with his then wife Catherine of Aragon. The couple dined in separate rooms - the first public indication that something was wrong.